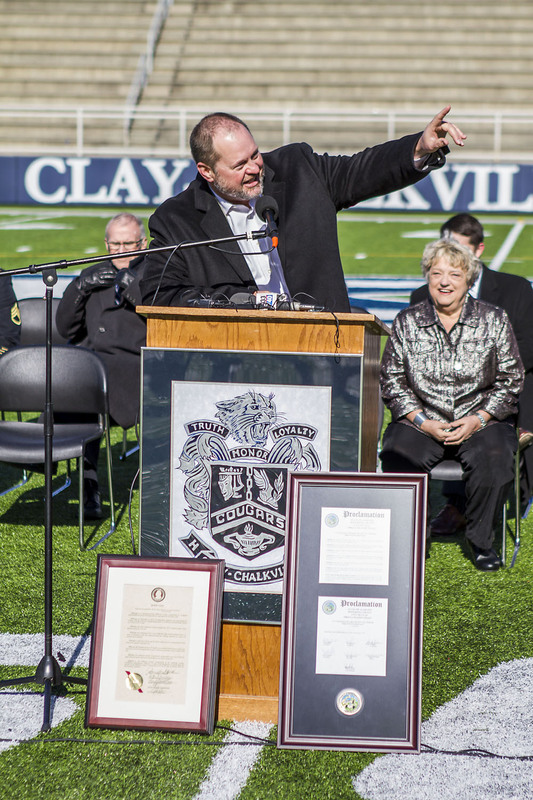 CLAY – Sixth-year Clay-Chalkville head football coach Jerry Hood took the podium at Cougar Stadium on Friday morning and did his usual. Standing before a packed home grandstands with local city officials at his back, he opened with a shout-out to the Clay-Chalkville Middle School football team for winning the Metro South Championship. 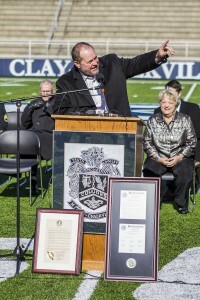 Clay-Chalkville head coach Jerry Hood speaks at Friday’s event. VIDEO: Watch a recap of Friday’s event at Clay-Chalkville High School, with comments from head coach Jerry Hood. But it wasn’t the middle school team that drew the occasion. Hood and his Class 6A state championship team were being honored by MaxPreps, a national high school sports media website, as one of its top 50 programs in 2014. The Cougars landed at No. 35 in the final poll. They along with Class 7A Hoover were the only state teams to crack the top 50, with the Bucs coming in at No. 44. 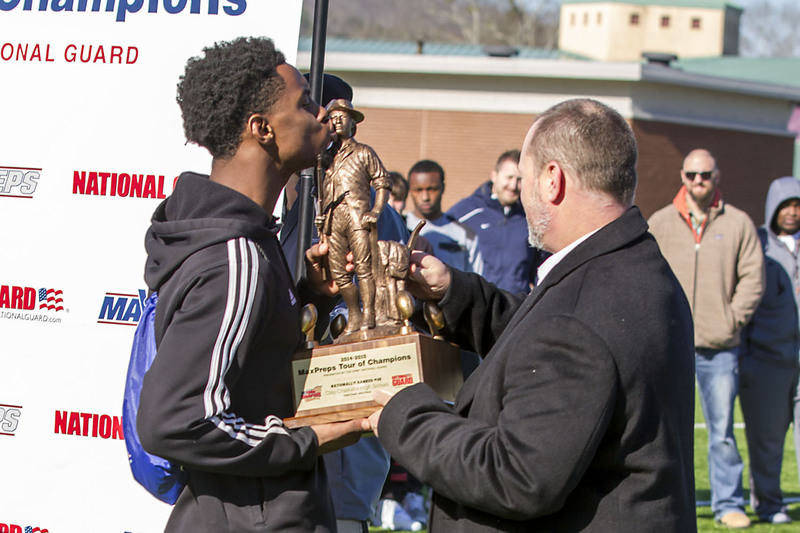 Shortly after congratulating his future players on their Metro South hardware and talking of the adversity his team overcame on its way to a 15-0 season, Hood and his roster were presented with the Army National Guard national ranking trophy. Clay-Chalkville wide receiver T.J. Simmons kisses the Army National Guard national ranking trophy. The website is celebrating its 10th year touring the nation’s most outstanding high school football programs. It started in 2005 by celebrating the country’s top 10. It’s the Cougars’ first time on the tour. MaxPreps pulls its top 50 ranking from a pool of more than 16,000 teams from across the nation. Clay-Chalkville was also officially presented its Class 6A state championship trophy from the Alabama High School Athletic Association.